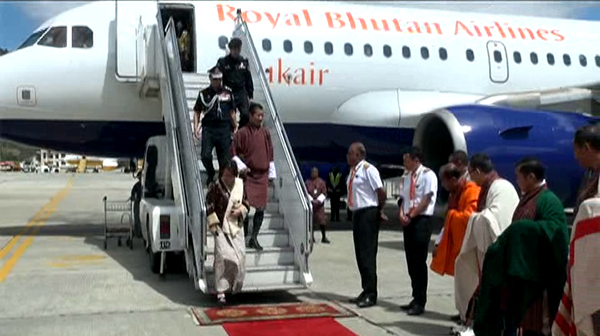 The Prime Minister Dr Lotay Tshering says his four-day visit to Bangladesh has been a successful one. He arrived in the country this morning from Dhaka. The Bangladeshi Foreign Minister saw off the Prime Minister from the Hazrat Shahjahal International Airport in Dhaka. “The visit has been a huge success. This is what I can report to all the people of Bhutan. We have been able to enhance the ties between the two countries as well. If two countries want to work together, the people of the two countries need to be mutually cooperative first,” the prime minister said. During the visit, the prime minister met with the Bangladeshi President Mohammad Abdul Hamid, attended a banquet hosted by the prime minister of Bangladesh. He also met with the Bangladeshi health and family welfare minister, the minister for shipping and commerce minister. The visit also saw the signing of Memorandum of Understanding (MoU) between Bhutan’s health ministry and Bangladeshi health and family welfare to send medical doctors, specialists and sub-specialists in the country. A standard operating procedure was adopted for the MoU on the use of inland waterways for transportation of bilateral trade and transit cargoes. Other MoUs were also signed to cooperate in the field of public administration, tourism and agriculture. Lyonchhen also attended the Bangla New Year celebrations in Dhaka yesterday and visited one of his former universities in Bangladesh, the Mymensingh Medical College. The prime minister was on an official visit to Bangladesh upon the invitation of Bangladesh’s Prime Minister Sheikh Hasina. He was accompanied by the foreign minister, the health minister, senior government officials and private sector representatives. The formal diplomatic relations between Bhutan and Bangladesh were established in 1973.